‘Light Shining in Buckinghamshire’ by Caryl Churchill, is a powerful examination of the collapse of society’s rules in a time of revolution; it explores what happens when long-established beliefs are challenged in desperately hard times. The revolution concerned is the glorious English revolution of the 1640s and the play shows the impact of these momentous events on ordinary people; the soldier radicalised by his exposure to the democratic movement, the women driven from her home struggling to survive in an intolerant and authoritarian society and the ‘ranters’, heretical individuals who preached their gospel of liberation in defiance of church and state. Many of the view expressed by the ‘ranters’ and the language they used, was considered blasphemous and offensive at the time and some may still find it offensive today. Light Shining in Buckinghamshire, created in 1976 as a response to the prevailing political and economic crisis which rocked the foundations of British society, is as topical today as ever, as institutions considered sacred are called into question. This production, (greatly abridged from the original to one-act) full of great passion and fervour, with a dark and satirical humour running through it, should not be missed. 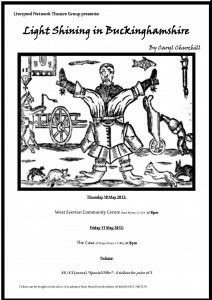 Light Shining in Buckinghamshire was performed on the 10th May 2012 at West Everton Community Centre and the 11th May 2012 at The Casa in Liverpool. Produced by Frank Kennedy and Directed by Matt Wade, it starred Sean Gaffney, Geraldine Moloney-Judge, James Gray, Peter Harris, Faye Christiansen, Robert Douglas Griffiths, Rachel Ashton, Frank Kennedy and Matt Davies.